The state of Montana has two national parks, whhich just happen to be two of our most famous national parks: Yellowstone National Park and Glacier National Park. Yellowstone National Park spreads into three states: Idaho, Montana, and Wyoming. It has more than 300 geysers, many hot springs, spectacular scenery, and is known for it’s wildlife such as grizzly bears, wolves, and the largest remaining herd of wild American bison (also called buffalo). Yellowstone was the first designated national park, created on March 1, 1872. 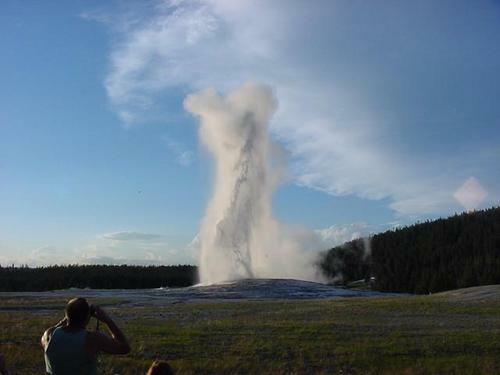 One of this park’s most familiar features is the Old Faithful Geyser (pictured above), which errupts, on average, every 94 minutes. Yellowstone National Park is one of the most seismically active areas in the world, averaging over 1,000 small earthquakes each year. 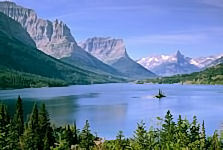 Part of the international Waterton Glacier International Peace Park, shared with Canada, Glacier National Park has over 50 remaining glaciers and 130 named lakes under the tall Rocky Mountain peaks. There are historic hotels and a landmark road called the Highway to the Sun, in this region of rapidly receding glaciers. These mountains, formed by an overthrust, have the world’s best sedimentary fossils from the Proterozoic era. Yellowstone National Park was the first national park in the United States. Situated in Wyoming, Montana, and Idaho, it is best known for its thermal pools and geysers, and for its vast array of wildlife.